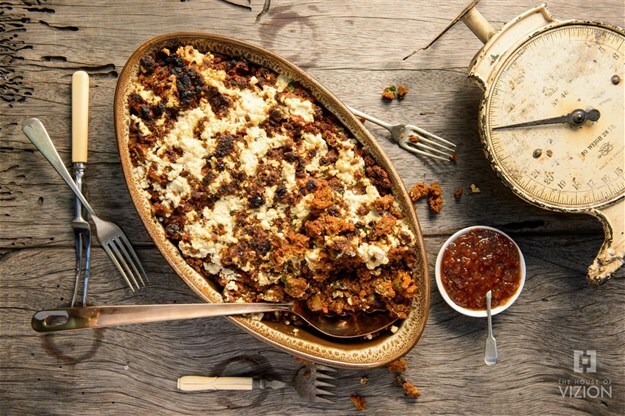 Traditionally, bobotie is made with curried minced meat and an egg-based topping and is probably the closest thing South Africans have to a national dish. The dish has Cape Malay roots and everyone's mother makes the best version there is. 1. Preheat oven to 180 °Celsius. 5. Remove from the heat and put in an ovenproof dish. 6. Put the silken tofu, kala namak, 1.25ml turmeric and Dijon mustard in a food processor and mix until smooth. 8. Bake at 180 °Celsius until your tofu mixture on top begins to turn golden brown.